Forest Hill personal support worker Saida Abdullahi is pictured here after receiving her Everyday Hero Award at a recent ceremony at the Kanata, Ont. long-term care home. 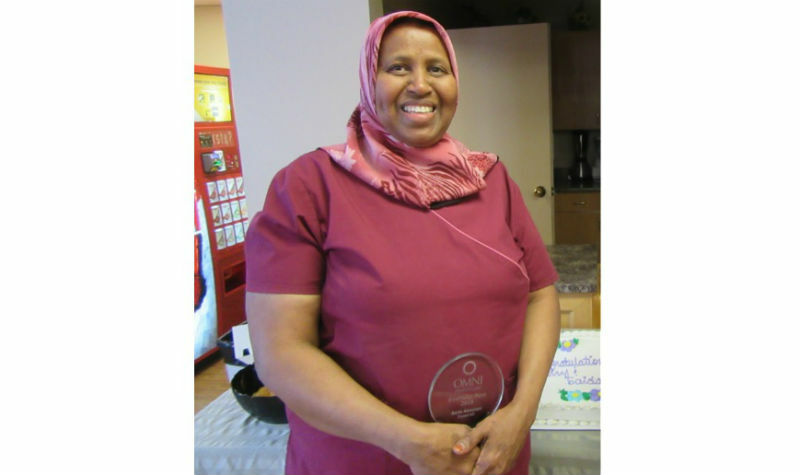 Saida Abdullahi, a personal support worker (PSW), recently received the Kanata long-term care home’s Everyday Hero Award. The accolade recognizes employees who bring to life OMNI’s Mission, Vision and Values in the workplace and demonstrate kindness and caring through their actions. Assistant director of care (DOC) Nicole Fulford, who nominated Saida for the award, says she’s a worthy recipient. “Saida faces each day with a smile, her quiet and genuinely kind nature can be felt by all in her day-to-day practice here at Forest Hill,” Nicole says. Saida treats each person with respect and dignity and invests the time to get to know each resident and his or her family members. She provides care in accordance with residents’ unique needs and wishes. The PSW’s peers describe her as kind, caring and having a big heart. “She serves as a role model for her peers and inspires staff to be the best they can be, setting a positive example for all. Well done Saida,” the assistant DOC says.